This week: Opening Day for 365 Whole Foods Market, Chef Esdras Ochoa of Mexicali Tacos opens a new restaurant, summer pizza-making classes at Pizza Romana and lots more. Hanjip just launched a Happy Hour menu filled with Korean BBQ style bites like Mister Oh’s ribs, pork buns, hot wings, seafood pancake, beef poutine and more ranging from $6-$12. Wash it all down with $2 soju shots, $8 wines and large beers for $9. Chef Esdras Ochoa, of Mexicali Tacos just opened up a new spot focused on mesquite grilled meats in Frogtown called Salazar. Highlights include taco de carne asada in a homemade tortilla, and Arrachera, a Northern dish with skirt steak and salsa vaquero. Unlike Mexicali there is a bar program with Michelada Negras, alcoholic frescas and horchatas. The first 365 Whole Foods will finally open in Silver Lake this Wednesday. The first 100 shoppers will receive gift cards in varying amounts and the first 365 guests will receive free mini-scones, vegan cookies and reusable shopping bags. Learn to make your own Pizza this summer (June 4 and July 9) at Alex Palermo’s Pizza Romana. Palermo will walk guests through making their own Roman-style pies and provide wine tastings from his extensive collection of Italian varietals in the restaurant’s private wine room. The $60 class includes a family style meal and wine pairings. Looks like only Mastercard users can get in on these classes as seen on the purchase link here. Cocktail connoisseur and award-winning Hey 19 Public House/Ortega 120 owner Demi Stevens is bringing back her infamous Brown University “semester” with Patron. Expect Demi to introduce a four course meal all pair with Patron tequila. The class cost $75 per person. The summer series kicks off this Memorial Day weekend, featuring a Yakiniku DIY tabletop grilling experience, rotating guest DJs, craft cocktails, and more. The meal cost $35 per person and takes place every Sunday for summer. Modern Mexican taco spot Chicas Tacos in Downtown Los Angeles will officially open on May 30. Expect fresh authentic Mexican fare made with organic ingredients. From noon – 5 p.m. at the parking lot directly in front of Playa Provisions, guests can enjoy a beer garden featuring a variety of Stone Brewing’s craft beers on-tap, plus cocktails, grilled burgers, and hot dogs. A DJ will be spinning and local band Royal Rats will perform. Kid friendly entertainment includes face painting and an inflatable obstacle course. Tickets can be purchased at the door, pricing is TBD at the moment. Bourbon Steak Has a gold leaf burger for $34 made of wagyu topped with foie gras, truffle aioli, madeira mushrooms and an actual gold leaf. Burger offered through the end of the month. Hey 19 Public House will be offering a free side of their So Good I Can’t Remember bacon wrapped tater tots stuffed with jalapeno, spinach and ranch with the order of any burger and for those dining at the bar they can order $2 sliders. 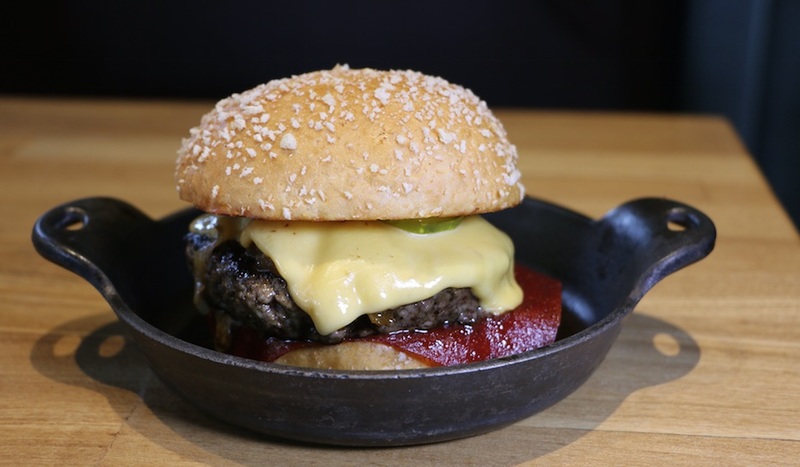 Plan Check Fairfax has their famous PCB burger for just $6 every Monday! Photo Credit: Brian Champlin/We Like L.A.
Fried chicken and donut hot spot Birdies has gone 24 hours Fridays and Saturdays meaning you can get a friend chicken sando at 2 a.m. if you want. Filipino restaurant Bamboo Bistro where guests can dine on pinoy items like isaw skewers, crispy pata, whole fried tilapia, pork liempo, kare-kare and more served family-style on tables lined with banana leaves. They have two locations one in Panorama City and the other in West Covina which also serves a Filipino breakfast buffet daily. Fried Chicken & Scallion Sage Waffles with spicy honey butter from LAMILL in Silver Lake. Also have to say their Hong Kong Milk Tea was out of this world, the sweetness was nicely balanced out by the premium black tea.